Before last month, the last time an Indiana bat had been seen in Georgia, LBJ was president. 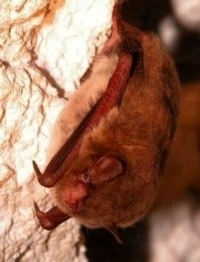 That footnote changed April 14 when private consultants tracked one of the federally endangered bats from a Tennessee cave to a pine snag at Georgia’s Rich Mountain Wildlife Management Area, on the Chattahoochee National Forest near Blue Ridge. Even better, researchers monitoring the female bat daily since have counted another 13 bats using one of the same roost trees. How many of the 13 are Indiana bats is not known, although the females do form larger groups in summer. Considering the number of bats and the time the Indiana bat outfitted with the mini transmitter has spent in the area, DNR biologist Trina Morris thinks the find represents the first maternity colony of these imperiled bats in Georgia. Morris said the recent discovery is significant and could factor into forest management. Indiana bats gather in maternity colonies under the loose bark of dead or dying trees and in hollow trees. Keeping snags, or standing dead trees, in the forest “is very important,” said Morris, who heads bat research for the DNR Wildlife Resources Division’s Nongame Conservation Section. Maternity colonies on the southern edge of the species’ range could be even more important if, as some observations seem to indicate, they are less affected by white-nose syndrome, a disease that has killed more than 5 million bats (video). Threatened by cave disturbances, loss of riparian forests, vandalism, pesticides and now white-nose, the population of Indiana bats has been halved since the species was listed as endangered in 1967. These small bats that can eat up to half their weight in insects each night are found throughout the Midwest and eastern U.S. Their name derives from the thousands that hibernate in caves in southern Indiana, forming clusters of up to 500 bats per square foot. After migrating to summer ranges, females give birth in June or July to a single pup each. 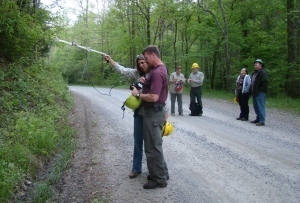 Staff from DNR’s Nongame and Game Management sections, the U.S. Forest Service and Copperhead Environmental Consulting will continue to shadow the Indiana bat at Rich Mountain WMA, hoping that she – and her companions – shed more light on this rare find and rare species. White-nose syndrome was confirmed recently in a bat collected from a Hamilton County, Tenn., cave on part of Chickamauga and Chattanooga National Military Park near Lookout Mountain. The cave is just across the state line from Georgia, where white-nose has not been documented yet. Two DNR bat interns are blogging about their work with bats on barrier islands. Read their first entry! One of the most interesting plants in Georgia backyards is often overlooked or scorned. 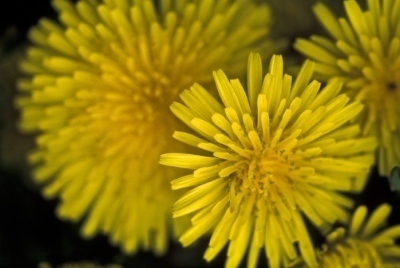 This plant needs no introduction; most of us know it as the dandelion. It’s hard to believe that the plant that fed and healed mankind for thousands of years is now considered by most Americans a weed so terrible many want to eliminate it at all costs. Indeed, time has not been kind to the dandelion. Why was it once treasured and carried from its native lands – likely Europe or the Mediterranean – almost worldwide by admirers, from Vikings to Puritans? The answer is quite simple. To our forefathers, the dandelion was a valuable source of medicine and food. It could even be used to make wine and beer. Delicious and nutritious, it was consumed by everyone from ancient Greeks to Confederate soldiers, who used dried dandelion roots as a substitute for coffee. The hardy perennial also has been used to help treat arthritis, pimples, heart disease and poor appetites, among other ailments. Other aspects of the dandelion are as fascinating – its blooms, its seed-spreading abilities and its worth as a food for wildlife. The war with some homeowners rages on. But read here for more of this column, and the next time you see a dandelion, I hope you will realize it doesn’t deserve the bad reputation. Terry Johnson is a former Nongame program manager with the Wildlife Resources Division and executive director of TERN, the Nongame Conservation Section’s friends group. Find all of Terry’s columns in this new "Out my backdoor" archive. Water hyacinths by the wads were removed from the Altamaha River south of Darien by volunteers and DNR, The Nature Conservancy and UGA Marine Extension Service workers April 26. The hyacinth "pull" targeted the showy South American exotic that can double its population in two weeks and cover the surface of slow-moving or stagnant water with thick mats that restrict light and sap oxygen levels, affecting native aquatic life. Though popular for backyard ponds, water hyacinths are trouble in waterfowl impoundments, where the mats limit access to water for waterfowl and hunters. 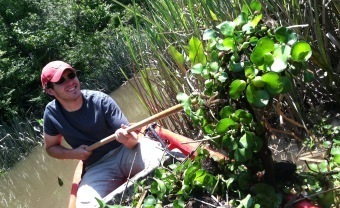 The group tackled the invasive plants by hand and rake (above), leaving the collected hyacinths high and dry to die. The loggerhead sea turtle nest count for Georgia’s barrier island beaches has reached 10 after a very early first nest was found on Cumberland Island April 25. Beach-by-beach updates from monitoring done by the Georgia Sea Turtle Cooperative are posted at seaturtle.org. Coastal boaters are encouraged to slow down and watch for sea turtles and manatees. Boat strikes are a leading cause of sea turtle strandings and manatee injuries and deaths. Survey flights started last week spotted a large manatee in Savannah, another in the Altamaha River in McIntosh County and as many as eight near Kings Bay naval submarine base. How many bird species did it take to win the annual Youth Birding Competition, held last weekend? Find out, and see the teams and top T-shirt art. 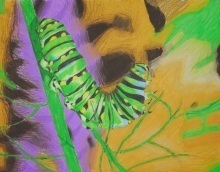 What about how many Georgia students entered this year’s Give Wildlife a Chance Poster Contest? Answers, and winners, are listed here, with best-of-class posters like the third/fourth grade division winner shown below posted on Flickr! Game Management Section staff of the Wildlife Resources Division teamed with Georgia Power to remove 6 acres of autumn olive on Dawson Forest Wildlife Management Area and 35 acres of privet and autumn olive on Hart County Wildlife Management Area. Another 6 acres at Dawson Forest and 12 at Hart County were treated to stem the invasive autumn olive from re-sprouting in areas where it had been removed last spring. Summer is wild at Charlie Elliott Wildlife Center, where day and overnight summer camps offer adventure such as fishing, hiking and live animal programs! There’s even a shooting sports camp. All are accredited by the American Camp Association. Learn more. And don’t forget: JAKES Day is set for 10 a.m.-2 p.m. May 12 at Charlie Elliott Wildlife Center. Admission is free and children’s activities at the center near Mansfield include archery, fishing, shooting sports and boat rides with a DNR ranger, plus wildlife presentations, solar viewing and face painting. Names in the news: Atlanta Journal and Constitution columnist Charles Seabrook has a new book, “The World of the Salt Marsh,” a University of Georgia Press publication that explores a natural and cultural resource Seabrook says is under siege. Entomologist and naturalist Jerry Payne of Musella is the subject of a 45-minute documentary by a friend, Tom Davenport. The trailer – Davenport is raising money to finish film – captures Payne’s inquisitive and fun nature (“Animals die all the time, but where do they go?”), plus his lifelong interest in wildlife. Green salamanders grow about 4 inches long and are marked by numerous irregularly shaped light- or yellowish-green blotches. The coloration is similar to lichens on the rock outcroppings and trees where these amphibians most commonly occur. 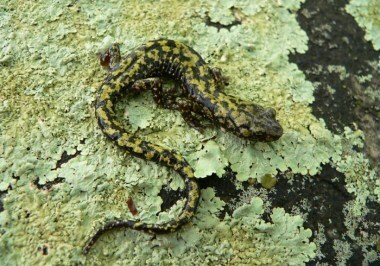 In Georgia, green salamanders are found in the Cumberland Plateau in the northwest corner of the state and the eastern Blue Ridge in the extreme northeast corner. The species' range extends from hilly and mountainous areas in southern Pennsylvania to northeastern Mississippi. Green salamanders (Aneides aeneus) eat small insects, snails, slugs and spiders, and spend their lives mostly in fissures on rocky cliffs and outcroppings. With their populations declining at least in the Blue Ridge, the salamanders are state-listed in Georgia as rare. Learn more about this species (pdf) and others in our state.